Copper? On Your Avocado Trees? At a recent Fresh Index-sponsored meeting, David Crowley recently of UC Riverside talked of a five year-long study that assessed nutritional status and yield. This has been a study area that has long been confused by the problems of alternate bearing, weather-dependency of the avocado, soil variability, root rot, etc. etc. etc. that we all know about. There are nutrient interactions that confound results, as well. High phosphorus affects micronutrient uptake of zinc, copper and others. Zinc impedes copper uptake. Loss of roots from Phytophthora especially affects micronutrients. Irrigation and aeration again affects nutrient uptake, and especially micronutrients. The elements coming from the soil are divided into primary nutrients, secondary nutrients and micronutrients. This grouping is based on the relative amounts required by plants, but all are essential. Crowley describes the relative need for each element being based on the “Law of the Minimum”; if only one element is deficient it eventually affects growth and yield of the entire plant in a negative manner. It doesn't matter how much the other nutrients are raised, if one is limiting, growth is limited by that one. The primary nutrients required by avocados are nitrogen, phosphorus and potassium. The secondary nutrients required are calcium, magnesium and sulfur. The micronutrients are zinc, iron, manganese, copper, boron, molybdenum, nickel and chlorine. The Law applies not just to nutrients but to light, temperature, water, disease, pests – anything that affects growth. The limiting input needs to be fixed before the others can boost growth to whatever the biological maximum might be in that environment. In irrigated agriculture, water is the most common limiting input. So, it is complex. Really complex. But with computers and different techniques of analysis and just looking at nutrients, Crowley has been able to get a better handle on what could be limiting growth in an individual grove. This applies not to what is lacking, but what might be in excess – too much chloride, too much nitrogen, too much……………. So, in the case of all this data collection the Crowley team has done, something unusual has popped up. Copper deficiency. Of course, why copper might be limiting is another question. Is it due to root rot? Interaction with other applied materials like phosphorus (not phosphite, phosphorous, phosphonate) fertilizers? With irrigation management? Something(s) to think about. And citrus in California is a different beast. 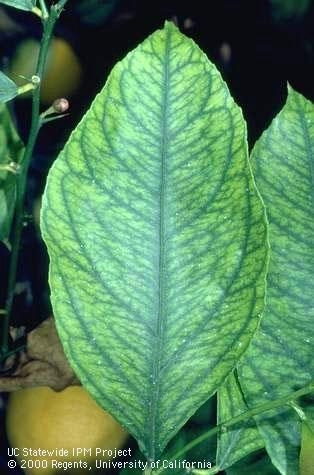 It can commonly show copper deficiency and be a limiting nutrient. We apply copper as a frost/brown rot/septoria spray and as a result don't often see deficiency in citrus. Liebig's Barrel. Optimum production occurs when all the barrel staves are as high as they can be. When one element is low, that becomes the limiting factor for production. Increased production doesn't occur until that uptake is improved and then the next limiting input restricts production. When that next one is corrected, then some other input then limits production. Correction keeps improving production until the biological limit is reached. 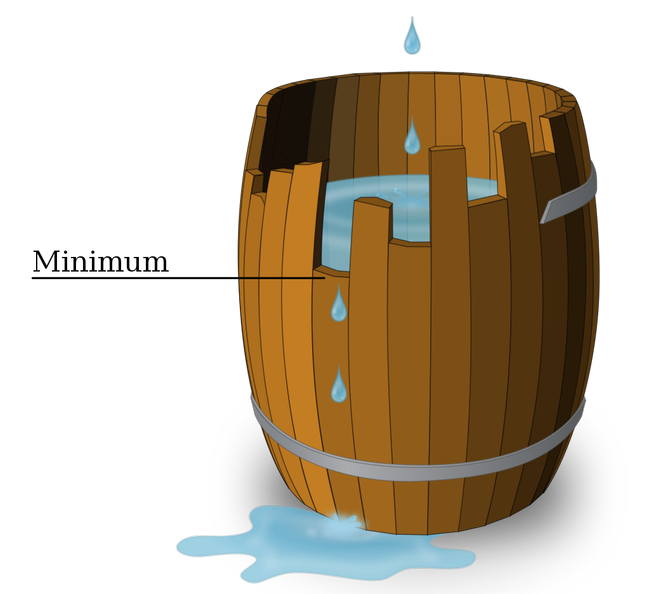 Have any readers actually seen a wooden barrel? It’s that time of year when citrus and avocado growers need to collect leaf samples for nutrient analysis to guide fertilizer applications. Leaves are collected between August 15 and October 15 and sent to the lab for analysis. For perennial crops, leaf analysis is the most important guideline for managing tree nutrient applications. Many growers think that soil analysis is as important as leaf analysis, and is for annual crops, but is much less valuable for tree crops. Because a tree stores nutrients in its various parts, such as roots, trunk, branches, stems and leaves, it does not have to get all of its immediate nutrients from the soil the way a lettuce plant does. Trees also have a root association with beneficial fungi called mycorrhizae (fungus/roots) which aid in the uptake of nutrients such as phosphorus and zinc, and this ability is not reflected in a soil analysis. A leaf analysis integrates everything the tree is "seeing" – weather, soil, in-tree storage, water, crop load, disease – which is then reflected in the leaf analysis. Leaf analysis is done at this period, because the leaf nutrients are somewhat stabilized. Young leaves are high in such nutrients as nitrogen and potassium, but low in zinc and iron. As the leaf matures it loses nitrogen and potassium, but gains in iron and zinc. 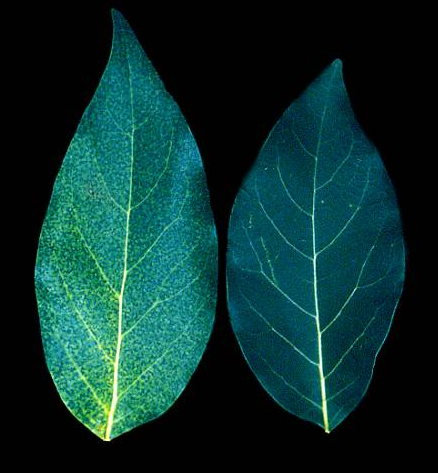 A fully expanded four-month old leaf from the spring flush taken at this time of year has been found to best reflect the tree’s nutrient status. 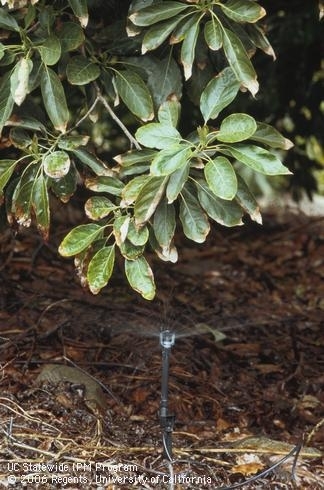 For a discussion on leaf sampling, see our fall 2003 edition of Topics in Subtropics - http://ceventura.ucdavis.edu/newsletterfiles/Topics_in_Subtropics3707.pdf. If leaf nutrients are low or high, it can indicate not only what nutrient is the problem, but also what sort of corrective actions should be evaluated. It may not be the lack of something like iron, but waterlogging from too long or frequent irrigations. Waterlogged soils reduce iron uptake, and this deficiency might be better addressed by correcting the irrigation practice than spending money on iron applications. Zinc deficiency might be a result of root rot killing root hairs that take up zinc and addressing the disease issue is going to have a longer term improvement on tree nutrient status than simply applying zinc fertilizer. And then of course, if leaves are showing toxicities to sodium or chloride, correcting irrigation leaching and infiltration issues is the way to solve this nutrient problem, since this the easiest way to solve the problem. This does not mean soil and water analyses are not important, on the contrary. A pre-plant analysis for water and soil can tell you before hand what you might be dealing with and allow you to correct the problem before planting. A high pH is best corrected before trees are in the ground. Trying to correct a zinc, iron, manganese, or copper deficiency with the trees in the ground is expensive and can take years to correct. It is easier to apply sulfur or sulfuric acid to the ground before planting and can be done relatively quickly without harm to the trees. The micronutrient availability is controlled by pH and once soil pH is in the 6-7 range, it is less likely for these deficiencies to occur. Trying to lower pH when the trees show iron deficiency, must be done slowly, since adding too much acidifying material at one time can kill the tree and during the process of acidification, some sort of stop gap measure, such as foliar feeding or fertigation must be employed until the soil pH has slowly been corrected. A water analysis too can forewarn you if you will be having problems with such things as high salinity, chloride, sodium, magnesium, boron or pH, and allow you to select appropriate rootstocks tolerant of the problem or again address it with soil amendments pre-plant. A soil analysis in conjunction with water analysis can also be used for an ongoing determination of how well irrigation is being managed. Soil from trees doing poorly can be analyzed to see if adequate leaching is being accomplished with the frequency and amounts being applied. Generally, though, a soil analysis is a poor indicator of guiding a tree nutrition program and as an ongoing practice should be used for identifying the toxicity problems of salinity, boron, sodium, chloride and pH.